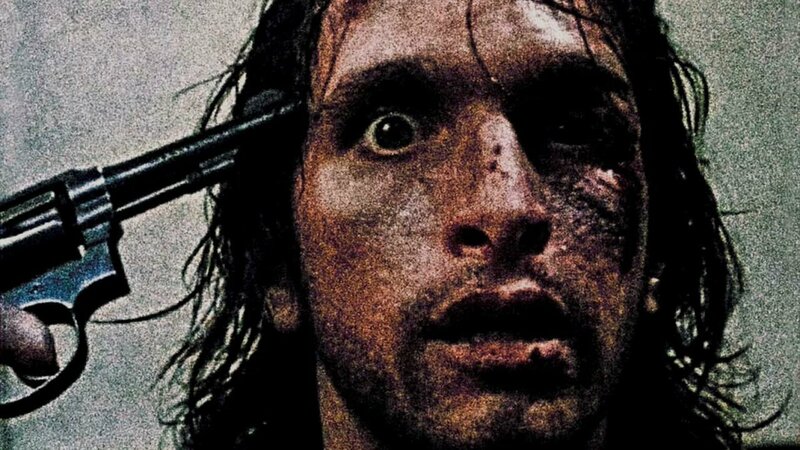 Combat Shock (1986) | "This Film Should Be Played Loud"
This grimy mutant lovechild of Taxi Driver and Eraserhead is undoubtedly one of the skuzziest movies I’ve ever sat through. Buddy Gionvinazzo’s Combat Shock (or American Nightmares to give it its original title, and the title that appeared on the Director’s Cut I watched) is sometimes just content to watch its lead character, frazzled and greasy Vietnam vet Frankie (Rick Giovinazzo), aimlessly wander the streets to the oddly bouncy electronic score (also by Rick Giovinazzo), but the rest of the time it’s happier squeezing him through an endless ringer of PTSD, torment and misfortune. Unfolding over just one day but punctuated by hyper-real and hyper-violent wartime flashbacks, this a grim and punishing endurance test. Not because of disturbing violence or gore, but because of the constantly unpleasant headspace it occupies; an overbearing atmosphere smeared over the entire thing like thick grease. When proceedings do finally take a turn for the bloody, it feels like a relief rather than a descent. Shot on a scrappy budget over a multi-year period, the film was eventually picked up by schlock-house Troma, given a hasty re-edit and released as a Rambo-esque action flick. But this might be the most thoughtful movie Troma ever acquired. Certainly in Giovinazzo’s director’s cut the feat of smuggling an ugly character-study into 42nd street theatres under the trojan-horse of genre is even more devilish. It forces a certain type of audience to suddenly confront and engage with an America they’d rather ignore and escape from. Imagine rabid fans of lurid delights slipping into this thing expecting a good time. Newsflash: they weren’t going to get it. Full of rough edges, unshapely editing and narrative structuring which plagues most low-budget independent productions, Gionvinazzo nevertheless proves to be incredibly resourceful and inventive with his limitations. The characters all register and there are odd digressions and instances of detail (a man stood in a welfare line with the arm of a mannequin in his pocket, for instance) or cheap rubbery special effects (I didn’t mention it before, but there actually is a mutant baby here), and shaky set design which all manage to enhance the film’s skewed and doomy personality, constantly on the verge of mental collapse. For all of its ugliness, Combat Shock feels like a barbed blast of frustrated artistic expression, depicting the unfortunate downfall of an angry and helpless protagonist who has no choice but to eventually decorate the kitchen wall with his own brains. Gionvinazzo’s film resembles a wet mass of matter, a sludgy mound held together by scraps of 16mm celluloid. It is the dirt under your fingernails, the stench of a bad day. A nasty and sour movie, but grippingly so. This entry was posted in Reviews and tagged 1986, Buddy Giovinazzo, Rich Giovinazzo. Bookmark the permalink.